Does the thought of routinely tracking your income and expenses make you cringe? I’m a little unusual in that I LOVE budgeting, at least most of the time! My dad always posted our family’s monthly budget on the refrigerator (much to my mom’s chagrin) where we could all see at a glance how we were doing. Even though my mom frantically flipped over the budget when company came over so that the whole world wasn’t privy to our spending habits, having that budget front and center taught me the importance of “knowing your flocks and herds” and the value that budgeting brought to our family. And so, when Jon and I got married, I started keeping a detailed budget. For years, I dutifully kept track of our expenses. Some months were pretty hard, as the outgo quickly outpaced the income, but I always knew right where we stood financially even if the situation wasn’t pretty. A couple of years ago, however, I got really burned out on budgeting, largely due to the frustration of always struggling to make ends meet. Although I haphazardly budgeted, many months I actually didn’t finish tallying our expenditures. Eventually, though, I realized that half-hearted budgeting attempts weren’t doing us any favors, so I resumed filling out my spreadsheets every month. But I found some fantastic shortcuts that took most of the pain out of budgeting! Some years ago, I was talking with our pastor's wife about the lean years when they were first married and he was still in seminary. She commented, "That Christmas, so many of our friends were talking about getting new furniture or something else big like that, but I would have given anything just to have a new potato peeler!" With Black Friday and Cyber Monday just behind us (do I hear a collective sigh of relief? ), you may be feeling overwhelmed with the "lightning deals" and "special steals" that were plastered absolutely everywhere. Maybe you were able to snag a few Christmas gifts at unbeatable prices. Perhaps you were even able to splurge on an item or two. But maybe you're in a situation where all you want this Christmas is a new potato peeler. Is It Sinful for Christians to be on Government Aid? When we first moved to the Bay Area, money was tight. We stressed over whether or not we could buy groceries or pay our rent. And although the Lord graciously met our needs every single time, that phase of life was anything but easy. One of the ways God provided for us was through various government assistance plans. From subsidized housing to Medi-Cal, my state's version of Medicare, we received quite a bit of help from these kinds of government programs. And I hated every minute we were on them. I think many of us who grew up in Christian homes came to believe that accepting help from the government was wrong or sinful. Since God's Word commands husbands to provide for their families, maybe we've just assumed that taking "handouts" of any sort is somehow evading this Biblical mandate. Whatever the root cause, it felt wrong to me to be on these programs, at least at first. All of these things have a common thread that makes my heart jump into my throat: the potential to create a financial crisis. Money woes cause me to panic more quickly than anything else in life (with the possible exception of illness). The combination of an empty bank account and an impending bill is enough to cause my heart to pound in anxiety. I'm guessing I'm not alone when it comes to being terrified by money issues. Jon and I have gone through layoffs, unemployment, and under-employment, all of which bring various levels of fear. I wish I could tell you that I've handled each situation with grace and poise. I wish I could say that I fully trusted in God's provision. I wish I could claim to have learned to put my complete faith in the Lord as a result of these trials. I am very human, and lack of money quickly reveals how fickle I am. So, while I can't say, "here are 3 things I learned as a result of an empty checking account," I can offer three things I wish I had done when each of those trials came and what I hope I will remember to do when the next wave of financial turbulence hits. One of the biggest mistakes I've made during financial crises is forgetting that the money was never mine to begin with. How much better would it have been if I'd stopped to consider that it all belonged to God, that I was merely a steward of what He'd given me, and that He was free to move His funds around as He saw fit? If you're facing a difficult financial situation, stop to consider that the Lord owns everything. The only way to gracefully endure fiscal hardship is to view "your" money as it actually is: God's. Instead of freaking out about your financial crisis like I've done, try to calmly view each money crunch as an opportunity to see God work. Everything God does is for our good and His glory (Romans 8:28, Isaiah 48:10). I have a very hard time seeing (at first) how God could be glorified and how things are for my good. I tend to see the crisis and not Christ. It might not be immediately obvious to us how He is being glorified or how we're benefiting from a situation, but since the Bible promises us these things, we can trust that they're happening. If you can see a tough situation as a front-row seat to God's handiwork, it will be much easier to accept the cup that the Lord has given you. God has graciously promised to provide for all our needs (see Philippians 4:19), but it's easy to get so caught up in the fear of the situation that we forget those promises. Grab your Bible, a pen, and a sheet of paper and begin jotting down verses about the Lord's provision. Don't forget Old Testament stories of God's protection and provision. Notice how, over and over again, the Lord graciously cares for His people. A word of caution is in order here, however: God definitely promises to provide, and He has proven His provision in Scripture over and over again. 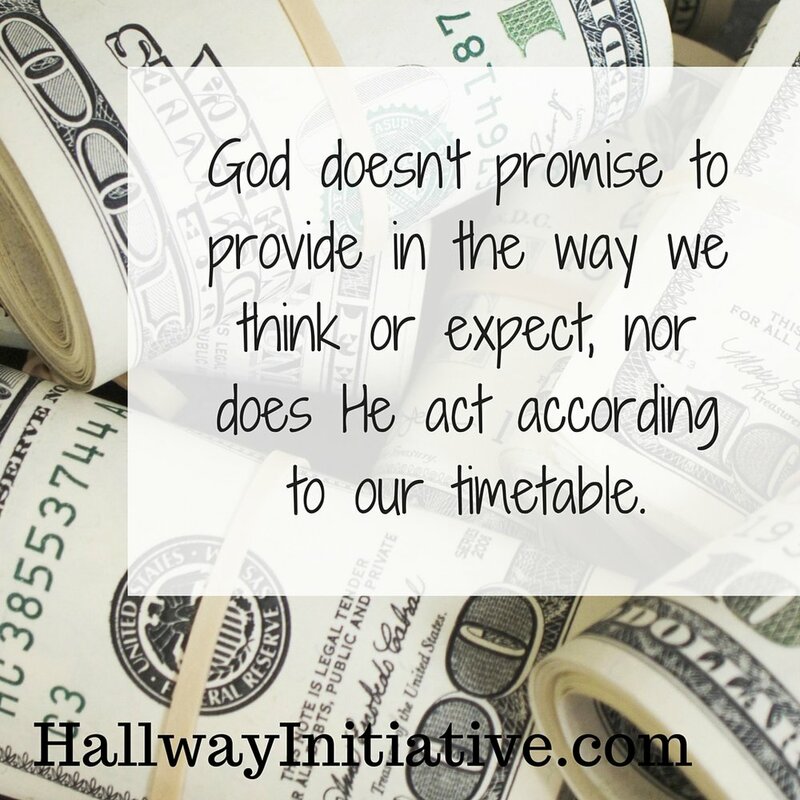 But He doesn't promise to provide in the way we think or expect Him to, nor does He act according to our timetable. He also doesn't say that we won't suffer while we're waiting for Him to act (otherwise, this blog would be obsolete!). The Bible promises us that suffering will come (James 1). Remembering that God owns it all, viewing a financial crisis as an opportunity to see God work, and writing down God's promises to provide won't make your current trial go away. But doing these things will give you a better mindset for handling the situation in a way that brings honor to the Lord. 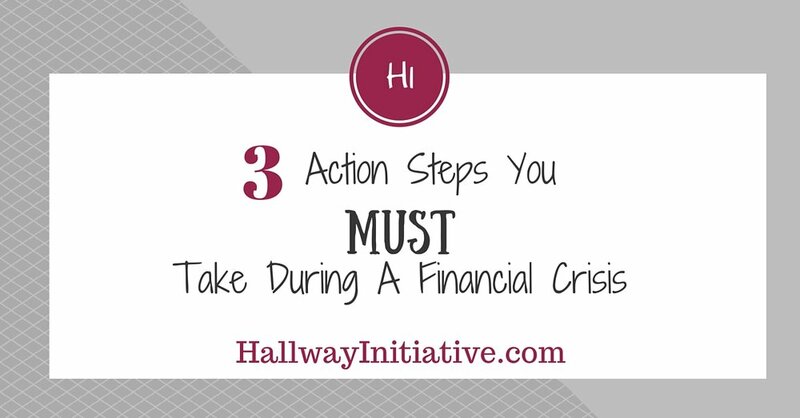 There often isn't much you can do during a financial crisis other than waiting, but these three things are action steps that you can do today, right now. Let's praise Him while we wait! Your turn: Have you gone through financial hardships? What has been the biggest help to you? Share with us in the comments! 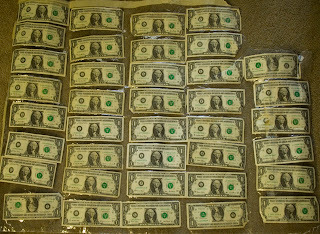 It might be hard to tell, but that photo is of 38 one-dollar bills all laminated together. Why on earth someone would do this and waste such a precious resource is beyond me. It was a sorry sight and didn't take much calculating to figure out what percent of a typical paycheck was stuck in that plastic graveyard. Instead of crying over the spilled milk, though, we turned it into a lesson for the kids. We asked the spark plugs whether or not the person who had laminated his dollar bills had been wise with his money; whether or not it was a good idea to deface money; and whether or not there were better ways of preserving currency. We then moved on to some deeper questions: in what other ways do we waste possessions that could be compared to the laminated money? What could we learn about stewardship from this odd object? Next, we looked into ways of fixing the problem. Jon had done some Googling that said occasionally banks would take the ruined money and exchange it for legal tender, so Monday the kids and I visited various banks to find out the validity of this claim. Based on the gawking stares of numerous bank tellers, I'm pretty sure most of them had never seen anything so strange before. While none of them were willing to exchange it, we were given the federal web site for damaged and defaced currency where we found instructions for mailing in the laminated bills. Supposedly, we'll be reimbursed for the ruined 38 dollars. We've not yet mailed the specimen to Washington's defaced currency agency, but it will be fun to find out what happens. While we might never be able to redeem those 38 dollars, we were able to glean very valuable lessons on using wisdom, being good stewards, and thinking through our actions. It was definitely worth the $38! Update: we did mail in the laminated money, but unfortunately, we never heard anything back from the office we mailed it to. Since we sent it by certified mail and received notice that it was delivered, we're assuming that the office doesn't normally reimburse people for ruined currency. Lesson learned! Your turn: Have you come across unexpected lessons? What have you learned from them? Have you ever dealt with ruined money? How did you handle it? The Reader Survey Results Are In! What Will You Do with Your Mites? What's Your Inner Susan Boyle? It's Here: The (FREE!) Waiting Well Planner! Does God Carry Your Suitcase?